A team of faculty, graduate students, and staff from the UofL Center for Health Organization Transformation (CHOT) traveled to McLean, Virginia October 10-12 to the Fall Industry Advisory board meeting. The purpose of the meeting was to discuss new research themes for Center sites for the next project year. 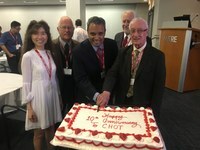 Comprised of researchers from University of Louisville and seven partner universities, CHOT celebrated its 10 year anniversary of research and industry collaborations. On hand for the celebration were founding researchers for the Center, including UofL SPHIS Dean Craig Blakely, and members of Henrietta Lacks’ family. Another highlight of the conference was the poster presentation award earned by SPHIS Master of Science in Health Administration student Molly O’Keefe for her poster, “Telemedicine In Practice: A Systematic Review of Findings in Burn Wound Care Research.” Dr. J’Aime Jennings is the principal investigator on this project. For more information about CHOT, please email tiffany.robinson@louisville.edu or call 502-852-6450.